1. Preheat the oven to 190°C, gas mark 5. 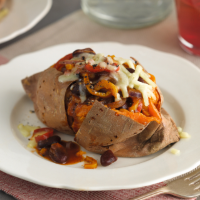 Bake the sweet potatoes for 50-55 minutes or until tender. 2. Meanwhile, spritz a frying pan with olive oil and cook the peppers and onion for 5 minutes until softened. Add the beans, cover, and simmer gently for 10 minutes. 3. Using a sharp knife, split the potatoes and spoon in the chilli mixture. Scatter over the cheese to serve. This recipe was first published in Tue Jan 15 15:18:00 GMT 2013.